Twelve community groups from Merseyside and Halton have received a funding boost to help make the region a cleaner and greener place. The financial support will see the groups help reduce household waste, encourage recycling and resource re-use, and prevent carbon emissions. The £115,000 is coming from the Merseyside Recycling and Waste Authority and Veolia Community Fund 2017/18, which has been running annually since 2006. Successful applicants have been awarded up to £25,000 for schemes which operate across Merseyside and Halton, and up to £8,000 for projects which work solely at local authority level. Graham Morgan, Chairperson of MRWA, said: “These projects can have a significant impact on their local community and make Merseyside and Halton a cleaner and greener place for us all to live and work. Giving groups the opportunity to get involved in looking after their environment can only bring benefits to all and can help us appreciate items as valuable resources rather than something which otherwise might be just thrown away. The Children’s Food Trust is one organisation to have previously benefitted from the Community Fund. Head of Cookery at the Trust, Maggie Sims, said: “We at The Children’s Food Trust are extremely grateful for the support our projects have received from the Community Fund. Food waste is something we are extremely passionate about tackling. We are working to reduce avoidable household food waste and to enable families to save money and the Community Fund has enabled us to do this. Projects have until March 2018 to deliver their schemes. The impact of the 2015/16 Fund saw 10 projects deliver 71 full time equivalent jobs (created or safeguarded), participation by 253 volunteers, 24,256 people directly engaged, 680 tonnes of waste material diverted from landfill and £68,000 of equivalent landfill costs avoided. Projects included refurbishing old bicycles, providing young adults with cookery skills, delivering workshops on textiles and clothes repair and training people to make attractive furniture from waste. 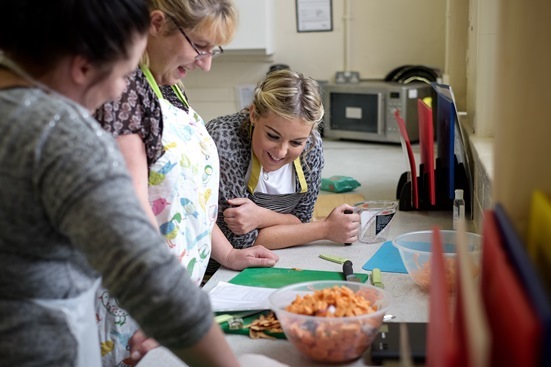 Pictures show previous Community Fund recipients Children’s Food Trust hosting a cookery skills club. The Trust will expand on previous successes of the ‘Mersey Waste Munchers’ project, focusing on changing food waste behaviours throughout Merseyside and Halton. Amongst other things the project will provide training and resources to teach families how to change their food waste behaviour and run 20 ‘Mersey Waste Muncher’ clubs for adults with young children living in areas of high deprivation. Waste wood (fence panels, broken furniture, old doors and door frames etc.) from Registered Social Landlord properties will provide materials for a Craft Workshop at Home Farm in Croxteth where adults with learning difficulties will create garden and home products via fully supported therapeutic employment activities. The project will also introduce a ‘Crafting with Recycled Materials’ training programme to residents across the city region. Project UP gives furniture a second life through reuse and redesign. This project will collect domestic furniture, upcycle it via the Project UP workshop and then redistribute it within the local community. It will mainly focus support to those most in need by providing furniture free of charge. This project will see recovered bicycles recycled, workshops delivered for bike maintenance and repair, and community bicycle sales to the public at reduced costs. Funding will establish Centre 63 as a ‘ReMake yourself’ hub, specifically designed to upskill vulnerable and disadvantaged young people within the Knowsley and Liverpool district in a range of upcycling and refurbishment activities, including taking in unwanted furniture/bicycles from the community and selling them back at a low price. The funding will help recycling and waste management projects and activities in the wards around GTDT on Lodge Lane including Picton, Princes Park and Greenbank as well as Kensington Fields and Riverside. The Trust will continue to work with MRWA to develop models of good practice within communities to create packages of support which promote good recycling practices and help to change people’s behaviour. Leave Liverpool Tidy is a reduce, re-use and recycle project which reduces the amount of reusable items going to landfill. This is achieved through the collection of unwanted items from both the Dales area and University Halls of Residence. These donated items are then redistributed to those who need them; traditionally this has been those in the local community and students. The grant will help create a dedicated ‘safe space’ for students within their Foundation Learning programme – a course which supports personal and social development, and employability skills for students with learning difficulties, such as ASD, MLD and Down’s Syndrome. The project itself will be an opportunity for students to contribute and enhance their skills while an existing space will be upgraded using a range of ‘traditional’ household waste (food and drink packaging, house/garden furniture, tyres, etc.) to help create ‘sensory pockets’ across the garden for students to engage with. E-Cycling is about giving volunteers and staff at the Emmaus charity superstores the skills to establish the recycling social enterprise at a higher level: to establish it as an e-business, where it can raise further and wider awareness of recycling through social media, and where the public can both recycle and purchase recycled and upcycled goods online. The project ‘New to You’ is to set up a charity shop within the Tomorrow’s Women Wirral centre. It will give local women the opportunity to gain retail experience, whilst continually learning about recycling and re-using and act as an opportunity to showcase to visitors how women can make a real difference with the learning gained and how it can be disseminated into the community. A Community Reward Scheme will target local disadvantaged and Black & Minority Ethnic households, who have a disproportionately low level of awareness of waste prevention, recycling and reuse. Residents who sign up to the scheme will agree to a target to reduce their household waste. In return, households that meet their target will receive a reward to sustain and make other positive changes at home to prevent waste, and encourage reuse and recycling with a focus on textiles, food and garden waste. Awareness sessions and ‘green’ activities will be delivered in community group settings and events which will promote the project to communities and promote positive changes in the home. This project aims to encourage more Wirral residents to help us re-use and recycle their unwanted and preloved items and generate income for local hospice care. The grant will help to deliver reuse initiatives and events, recycling projects and volunteering opportunities.